In honor of the Eagles big win, defensive end Chris Long generously gifted bottles of Crown Royal XR to the entire 2018 squad. 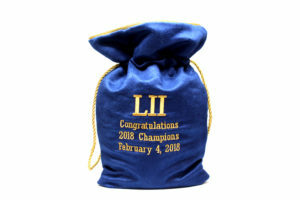 The bottles of $130 whisky come enclosed in blue velvet bags that were embroidered to reflect the team’s achievement. Crown Royal donated a total of $100,000 to Waterboys, a charitable organization within the Chris Long Foundation. Waterboys has funds life-sustaining water wells for East African communities and Crown Royal helped fund two additional wells for those in need during the football season.